As Christmas is just days away now, we would like to take this opportunity to wish all our customers over 2018 a Merry Christmas and Happy New Year! As a very busy year draws in, Entire Training begins to review another successful year. 2018 has been great for Entire Training, and we hope our network of learners, tutors and facilities continue to grow into the new year. The highlight of this year has been the copious amount of support that we have received from our partners, which has allowed us to access state of the art venues, enabling us to provide the best opportunities to our students. As well as bringing to life lots of remarkable professional working relationships with our partners, we have also had the pleasure of engaging with some wonderful students who have enabled us to continue to expand. Entire Training would like to make it known that we recognise the impact our partners and learners have had in making our business a success. We are always striving to improve our qualifications and expanding our course range to accommodate trainers’ needs. From a beginner Gym Instructor course to specialised qualifications like the Sports Massage Course and Group Indoor Cycling Instructor Course. In 2019, Entire Training will continue to help our trainers to develop the skills and knowledge they need to be successful in the health and fitness industry. So, as we approach the festive period, we would like to send a sincere thank you and best wishes to you all. It is with great appreciation that we recognise that without your contribution our progress would not have been possible. If you’d like to start the new year with a new career, or perhaps further your career within the fitness industry, get in touch with Entire Training for our range of health and fitness courses. For more information you can call us on 0161 826 5629 (North) or 0203 8418880 (South) or contact the friendly team online. 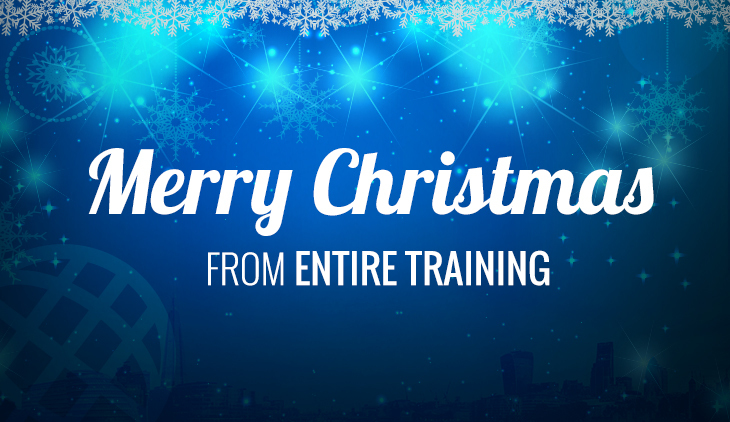 Find out more about the leading UK based personal training qualification provider.